The second release is a transmission unit consisting of 2 powerful gear head motors and 2 monster pin spike tires that are ideal for traversing rough terrain. One unit (1 tire & motor) can support approximately 2kg, with total supporting weight of approximately 4kg. 380K75 motor running from a DC7.2V power source has rotational speed of 242 rpm (unloaded) and max torque of 5.0 kg/cm. Running speed is 1m per 1.35 seconds (with 4kg load). Total weight of set is 660g. 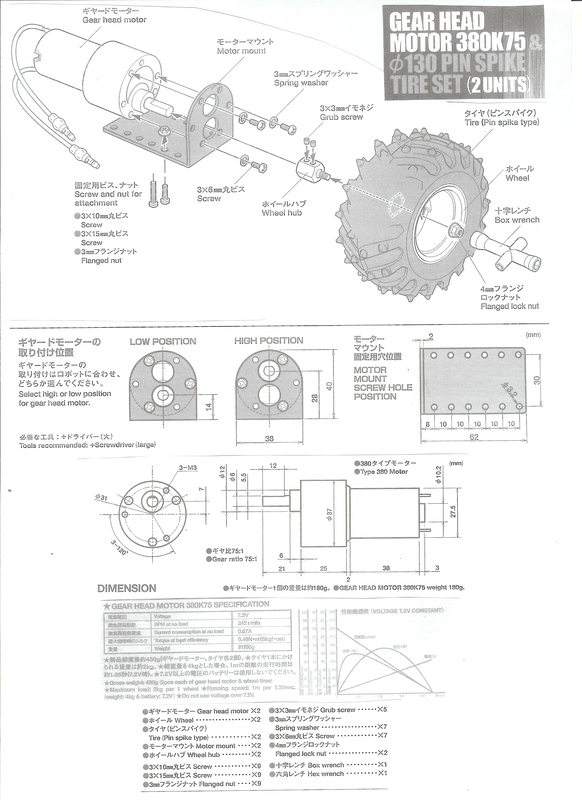 Check with our hardware parts and ball caster. Solar motors can be found in our solar product page. For motor driver chips and drivers, please visit our driver selections. Motor wheels and tires are also available.